The Lloyd Center’s Visitor Center is currently closed to the public for the first phase of renovations to the main building. Please enjoy our trails, open dawn to dusk, seven days/week. To ensure that everyone can enjoy our coastal resources, the Lloyd Center charges no entrance fee to the building or grounds. We invite you to hike our trails, visit our exhibits, become a member, volunteer, and participate in our many education, research, and outreach programs. We are writing today to ask you to join the Lloyd Center as a member. monitoring of threatened and endangered species throughout the state. There are some big changes underway at the Lloyd Center. Our innovative new Welcome Center is under construction, and the Visitor Center is currently closed while undergoing a renovation! During these important projects, the trails remain open and our outreach offerings for all ages continue. The Lloyd Center serves individuals, agencies, and organizations in southeastern New England – Rhode Island to Boston to Cape Cod. It is the only area organization focused on educating the public about coastal and watershed issues, and conducting research on coastal ecosystems and endangered species. The Center cooperates on a broader level in coastal, environmental, and educational programming throughout New England, nationally and internationally. Our school-based activities further expand our reach to urban audiences. A scholarship program also provides space for ten urban New Bedford students in our Summer Program. Take your dog for a wonderful walk around the Lloyd Center! 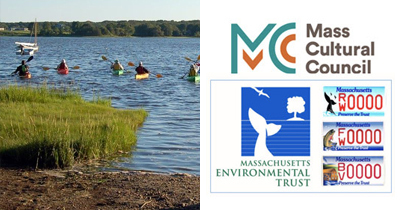 We are funded in part by state agencies Massachusetts Cultural Council and Massachusetts Environmental Trust.